All participants must use Orion targets. Targets must be mailed in no later than Saturday of each week so that they be can scored using the Orion system (or email scores if Orion system is accessible to you). Sporter: Jrs. 7-10, 11-14, & 15-18, College, Adult 19-54, Senior 55-up. Shoot Right is a division of Child And Adult Safety Education Services, Inc. (CAASES), a 501(c)3 non-profit org. National Match Air Rifle (NMAR) is a new multi-faceted air rifle competition discipline that is fired indoors or outdoors on 10-meter (33 feet) ranges. NMAR events simulate highpower rifle shooting and are fired on reduced highpower rifle targets. NMAR offers both serious, high-level competition for dedicated competitive rifle shooters as well as a recreation-oriented shooting sports activity for new and casual shooters. * To offer air rifle competitions that replicate the unique challenges of traditional service and highpower rifle match where competitors do precision and timed fire shooting in three different firing positions, prone, sitting or kneeling and standing. The Match and AR Clone Air Rifle Divisions emphasize this type of shooting competition. * To offer accessible, recreation-oriented air rifle competitions for adults and juniors where equipment and accessories are affordable and the courses of fire can successfully be completed by competitors who have had limited marksmanship training and experience. The Sporter Air Rifle Division emphasizes this type of shooting. * Highpower Rifle Shooter. If you are an active highpower or service rifle shooter, NMAR gives you a chance to practice the same skills with an air rifle during the offseason that you need to compete successfully with your highpower rifle during the summer outdoor season. In NMAR, you use an air rifle that looks and feels like your service or highpower rifle. You also use the same shooting jacket, sling and other equipment that are part of your highpower rifle gear. * Adult Air Rifle Shooter. If you are past junior or college age when you fired standing or three-position air rifle and want to continue competitive air rifle shooting, NMAR may be a great way to do that. In NMAR, you can use the same competition air rifle (precision or sporter) you used before, plus you will be shooting a three-position course of fire and targets that could get you involved in highpower rifle, the most popular rifle game in America. You can continue to use your shooting jacket, glove and sling, although special shooting trousers and shooting boots are not legal in NMAR. * New Shooter (ages 12-90). If you are a new or inexperienced shooter and are looking for a way to shoot for fun and recreation, NMAR should appeal to you. NMAR is a shooting discipline that features affordable equipment and easy-to-setup-ranges. No form of target shooting is cheaper or easier to start than air gun. If shooting for fun, keeping costs down and not having to buy a bunch of special equipment appeals to you, you should try the NMAR Sporter Class. NMAR is suited for shooters of almost all ages, from juniors who are able to safely handle an air rifle in three-position shooting to adult recreational shooters of all ages. * Club Leader. If you are a leader in a shooting club that is looking for a new shooting game to attract more fun-oriented or recreational participants and members or if your club is seeking a way to train highpower rifle shooters in the off-season or if your club wants a game to practice in the winter when outdoor shooting is impossible, you should learn how you can conduct NMAR matches at your shooting club. NMAR targets are scaled down reductions of highpower rifle targets. The AR-SR target simulates the 200-yard SR target. The AR-MR target simulates the 600-yard MR target. 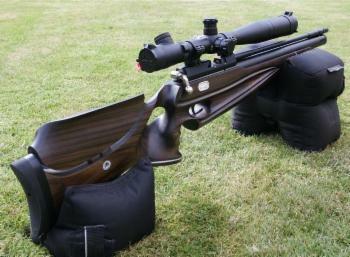 You need to decide which rifle class you want to try first and obtain a suitable air rifle. If you are new to target rifle shooting, the place to start is in the Sporter Class where air rifles are low cost and no special equipment is required or permitted. You can purchase reconditioned Daisy 853 pneumatic air rifles from the CMP for as little as $75. Legal rifles include the Daisy 853, 753, 888 and 887, Crosman Challenger 2009 and AirForce Air Guns Edge. They are generally available from shooting equipment suppliers for less than $500. If you already own a precision air rifle, you can use it in the Match Rifle Class. If you are serious about service rifle shooting you may want to look into obtaining an AR-Clone air rifle that simulates M-16 competition rifles. If you already have an AR lower all you need to do is order the MAR .177 upper, Contact Rob Potter with Shoot Right to order info@shootrightaz.org. I myself (Rob Potter) as a Vet have been looking for a program that mirrors the shooting I did while I was in the military. Now I found my shooting valve I hope to help our AZ, Southwest & West cost Adults and Jr's. in this new program. If you are interested in getting into NMAR please contact me Rob Potter info@shootrightaz.org. I will let you know where we are going to hold open shooting dates and tournaments.